Trumpeter Bubber Miley and Duke Ellington cooporated in composing immortal works like "East St. Louis Toodle-Oo", "Creole Love Call" and "Black And Tan Fantasy", songs that would be associated with Ellington for the rest of his career and introducing the sound that came to be called the Jungle Sound. 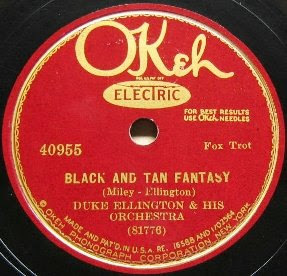 The first version of "Black And Tan Fantasy" was recorded by Ellington's orchestra with Bubber Miley as soloist on muted trumpet for Victor on 26 October 1927, a week later it was recorded for Okeh on 3 November 1927 - 2 versions exist, at least one of them has another trumpet soloist, probably Jabbo Smith. - Click on headline or here to listen to the version featuring Bubber Miley. 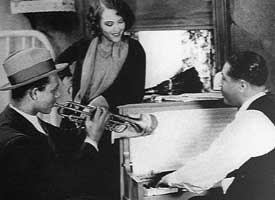 In 1929 film director Dudley Murphey produced a film based on "Black And Tan Fantasy" featuring Duke Ellington and bandmembers in their first sound movie. The film was built around Ellington's orchestra and also starred actress and dancer Fredi Washington, the tap dance ensemble Five Hotshots and a line of chorus girls from the Cotton Club. 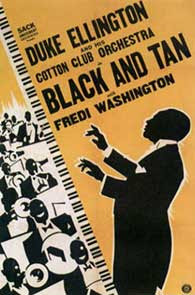 The plot is centered on Ellington's composition of Black And Tan Fantasy, supposedly written for Washington to dance to; the debut performance, however, is cut short when the character she plays suffers a heart attack, and her deathbed scene becomes the setting for a rendition of the piece by the orchestra extended with a gospel coir. The mood of the scene is captured in the music and further underlined through special shadow play and avant-garde lens effects.- In the film, Duke Ellington and His Orchestra play "Black and Tan Fantasy", "Black Beauty", "The Duke Steps Out", and "Cotton Club Stomp". You have an opportunity to view the film on YouTube, devided in three parts. Part one here. Part two here, and part three here. In 1938 Ellington and his orchestra recorded a new and extended version of "Black And Tan Fantasy" and in the 1950s it was recorded again featuring Louis Armstrong as the soloist on trumpet. I found a version by Ellington and orchestra from around the same time (- no date given) as part of a medley of the early highligts Black And Tan, Creole Love Call and The Mooche - enjoy it! Amazing - with this entry the keepswinging-blog has reached the number of 800! I'm shure your regular editor of the blog will comment on this, when he is back from his holidays. Till then I'm honored to be the guest editor, who had the opportunity to post this. Keep swinging!